Locomotive Mountain, 5 Sep 2015 | WANDERUNG! “Back to the Pemberton area again today for another hike in the mountains. 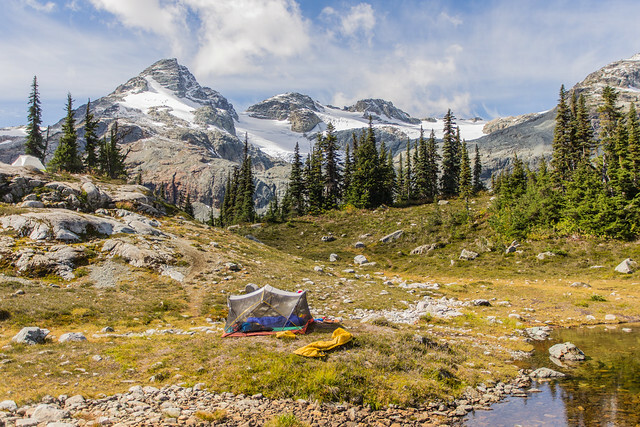 Semaphore Lakes is known for its great camping, as it’s a relatively short hike and there are many many spots to pitch a tent. But today, we did a day trip, leaving North Vancouver at 7:30 and making it to the trailhead at 10:45. The worst part of the drive is the last 17 km on the Lillooet FSR and the Hurley River FSR, which are gravel and full of bumps, potholes and rocks. Anyways, we made it to the trailhead in my 2wd Mazda 3. It was a bit nippy today, but the jacket was stripped off about 20 mins into the hike. The trail was very muddy, probably due to last week’s rain. It took us about one hour to make it to the start of the campsite area, 3 km from the start. We headed towards Locomotive Mountain, where 2 members of our group went on to the summit and 2 members explored the valley.